Argh! I knew this day would arrive and I knew the choices would be tough, but here it is 10:00AM on the 10th and I am still dithering! Pleas join Cathy at and Mandy to see how it all started and see more great posts! I have decided that I had to narrow my list down somehow, so it was best for me to stick to a theme (and 10 picture books I could not live without just was not possible- I am an international school teacher with a crazy big library and as I debate moving schools one of the first things I think about is what the school’s shipping allowance is)! I decided I would go with 10 picture books I want to share with my third graders the first week of school this year. Our first week is only two days this year, so I know I will not actually get them all in that soon, but you have to set goals, right? When I looked over my long list of books I wanted to share it came down to books that encourage an open mind, community, and being true to yourself (integrity). This was a book was new last year and it led to great conversations to being open to new friendships and the fact that friends can often be very different from each other. We also talked about the need to tell your friend what you are thinking and not rely on them to know what you need. Ame Dyckman was a great first author Skype for my class and we have plans for this year already! This book is a great reminder about how scary new beginnings can be (even for bold third graders). It is great that the sea monster tries to make new friends as he goes to school for the first time, while making sure that he remains true to himself. Kate Messner also wrote the Marty McGuire that we will read later in the year as part of the Global Read Aloud. This book is perfect for third graders! It will remind them of the many favorite picture books they already know (and introduce some new ones) and validate their feelings that they do not need to let these books go. So many kids and parents feel like they have to move past picture books- not true, and I think this book will be perfect to start this conversation. Last year I read this book on one of the last days of school, but this year I want to start with it. Third grade is often the time when some children become aware that parts of school are not easy for them and that they need support and this can make some kids feel self conscious. I want to send the message that each of us has a different journey and that my job as a teacher is to help them unlock books so that they can truly be lifelong learners. Who wouldn’t want a Mr. Falker in their lives? It is great to be able to share that reading and writing was a struggle for the author and now it is how she makes her living. I also like to tell students that it was a Patricia Polacco book years ago that made me realize (duh!) that picture books are for everyone! We end up reading many of her books throughout the year. Chrysanthemum written and illustrated by Kevin Henkes is perfect for our international classroom as we learn about each other. Some students have names that sound unusual to other students and this leads us to talk about what we want to be called. It is also a great link to our second unit on identity. Ish written and illustrated by Peter Reynolds This book will lead us to discuss the hard work ahead. In our class it will be important to set goals and work toward them, and nobody can do that without mistakes along the way. Our classroom must be a place where we all feel safe to make mistakes so that we can learn more. I love that Carol Dweck’s research about fixed and growth mindset links to this. If you think you can you are far more likely to succeed than if you think that you can’t. Each Kindness written by Jacqueline Woodson and illustrated by E.B.Lewis was the only book that I read last year to my class that totally silenced them (in a totally good way – there was a gasp as the book ended). This book will help us to talk about inclusiveness and the words and actions we choose. This book does not end with a typical happily ever after feel, and therefore it was a book that came up in conversation again and again. It will be a great anchor text for our classroom community. written by Derek Munson and illustrated by Tara Calahan King is a book I have used for years to encourage being open minded. At our school the classes are mixed up each year and we also have new students joining all the time. It is so important that kids feel welcomed and open to new people and experiences and this book helps us see this in a funny way (as a side note I am also always surprised by the literal understanding of some students as at least one each year will ask if there really is such a thing as enemy pie). I love this book for so many different reasons and we come back to it often as readers and writers (poetry, main idea, determining importance, etc.). As we build our community it is great to hear what the students think is important about so many things. What is important about school? Third grade? Reading? Math? Recess? Friendship? This book can take us in so many different directions! So, there you have it, my list! 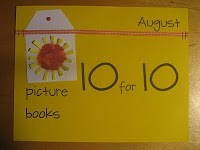 Careful observers will note that my #pb10for10 has only 9 books on it! Why you may ask? School starts in 12 days and I am sure that in those 12 days I will come upon another picture book that I need to add to this list of essential books for the first week! Monday The Story of Fish and Snail arrives in my mailbox and from what I hear that may be the one, but I HATE to be limited, so I am on the hunt until the very last minute! I can’t wait to read what other people have chosen for this fabulous day! This entry was posted in Uncategorized and tagged #pb10for10 on August 10, 2013 by Ms Victor Reads. Great list! I’m definitely going to check out THE IMPORTANT BOOK. Fun list Erika. I definitely need to check out I Hate Picture Books. Love that Ish was on your list too. What a lovely list! Even if you don’t get them all in during the first 2-day week of school, these are the kind of books that are perfect any time. Which country are you living in? I’ve taught at international schools in Italy and Japan and have recommended teaching overseas to oodles of people–it’s an amazing experience, isn’t it? Replying to my own post…;-) Just saw in your “About” tab that you’re in Berlin. My dad was in the Air Force when I was growing up, and I spent most of my elementary years in Bitburg, Germany. Europe is such a fun place to be–so much to see and all (relatively) close by. Enjoy! Thanks so much for your list! I’m familiar with most of them, but I have not heard of “I Hate Picture Books” – guess what was added to my “buy” list? Love your list! Yes, great idea for a theme (and quite timely, too!) I just learned of Each Kindness this summer. Oh! Powerful story. Here’s my list: Top Ten Edgy Picture Books. Great list – so many great titles that I could have added to mine too. Great reads for the 1st week of school. Thanks for sharing! I had to smile at the vision of you packing AND SHIPPING boxes and boxes of books. Anytime I contemplate a move (within district) I look at my bookshelf and am instantly overwhelmed. I took the time to inventory my collection in June and it was a bit shocking (in a good way of course). You have many great titles on your list. Thanks for reminding me about Enemy Pie. I somehow always forget that one. I really need to check out “I Hate Picture Books” — the title scares me, but it has been on several lists as has Each Kindness. Another title I must reserve now!